Scott Speed is first ever ARX Champion! 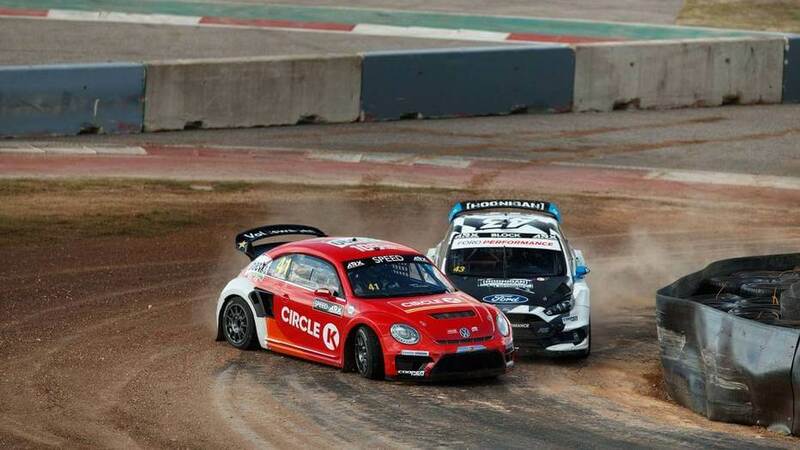 Scott Speed from Volkswagen Andretti Rallycross’ claimed the inaugural Americas Rallycross (ARX) title at the Circuit of The America. His teammate Tanner Foust fight like gladiator but even maximum points in Texas didn’t help him in winning the competition. In a repeat of Q1, Foust again took the lead of his race in Q2 from the lights going out and set the quickest time to take the day one top qualifier. Loenbro Hoonigan’s Steve Arpin was again second in his Ford Focus RS RX and is second overall. 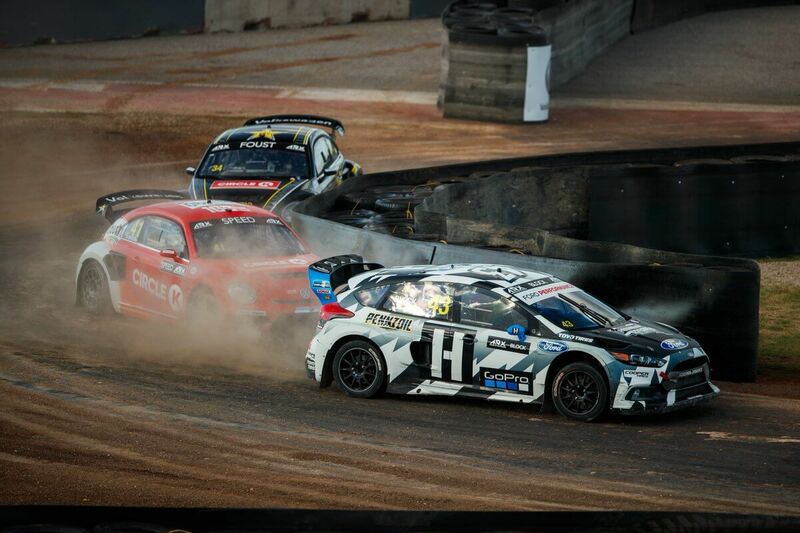 But, Championship leader Scott Speed was spun at turn one in the joker after contact with Ken Block’s Ford Focus. Speed saved the spinning Volkswagen Beetle and finished the race fourth, and was fifth quickest overall. Speed admitted a mistake in taking a second joker in Q1, but Block did the same in Q2. He had first been passed by GC Kompetition’s Liam Doran, the Renault Megane RS RX driver moving inside Block’s Focus at the entry to the second dirt section when Block was trying to pass his team mate Arpin. Subaru Rally Team USA’s Toomas “Topi” Heikkinen won Q2 race one after a turn one joker to beat team mates Patrick Sandell and Chris Atkinson and set third quickest time. Topi is fourth at the end of the first day at COTA, behind Doran. Block was ninth quickest in Q2 behind Xite Racing’s Oliver Bennett. Volkswagen Andretti Rallycross’ Speed took the holeshot in Q4 race two and went straight to the joker in front of team mate Tanner Foust and Subaru Rally Team USA’s Patrik Sandell, while Loenbro Hoonigan’s Ken Block was spun in the first corner squeeze after launching from pole position on the inside. Starting fourth on the grid, Foust was deemed to have squeezed the three cars on the inside in the run to turn one and was handed a 10 second penalty. He was seventh quickest but still took TQ (top qualifier) in the Intermediate Classification and closed the gap in the Championship to Speed to eight points with the semi-finals and final set to take place on the Circuit of The Americas this afternoon. Foust won Semifinal 1 having taken a point out of Speed’s Championship lead at the Intermediate Classification, but by winning Semifinal 2, Speed was assured of the title as long as he just started the final to claim the one point required to be the champion. He did indeed take the start, on the front row alongside pole man Foust and went straight for the joker as Foust took the hole-shot into Turn 1 ahead of Loenbro Hoonigan’s Steve Arpin. In the No. 43 Loenbro Hoonigan Ford Focus RS RX, Ken Block immediately pulled off the grid as the lights went green with a technical issue. Subaru Rally Team USA’s Toomas “Topi” Heikkinen and Patrik Sandell followed Speed into the Turn 1 joker, Sandell making a last moment change of decision to take the non-standard line. Arpin took his joker on the third lap and was passed by Speed, but held onto third. Foust then took his joker on Lap 4 but held onto the lead to take his second win of the inaugural ARX season. Speed finished second and Arpin claimed his first ARX podium in third. 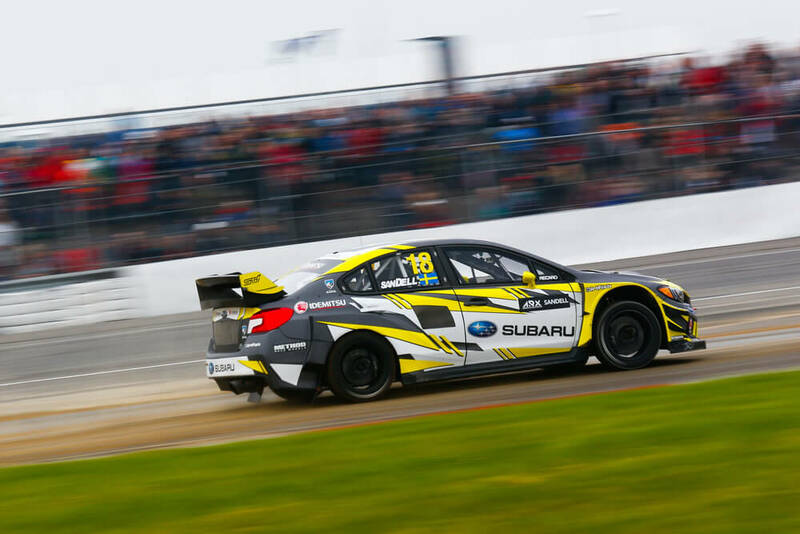 Heikkinen finished fourth in his debut for Subaru Rally Team USA and Sandell finished fifth in the last round and third in the championship point standings. Subaru’s Chris Atkinson and Xite Racing’s Oliver Bennett had a first-lap-fight in Semifinal 1 and GC Kompetition’s Liam Doran had a battle with Sandell in Semifinal 2 but finished the race with a puncture.